Yahoo's Other Billion-Dollar Bets: Where Are They Now? : All Tech Considered Tumblr joins GeoCities, Broadcast.com and Overture in the small fraternity of Yahoo's $1 billion-plus acquisitions. What can the company can learn from its previous purchases? 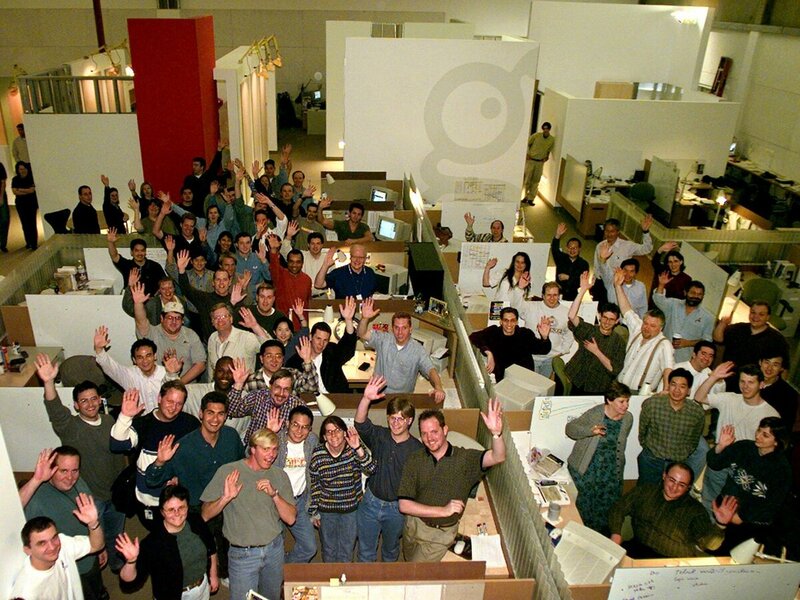 GeoCities employees pose for a picture in 1999 after the Yahoo acquisition was announced. Yahoo quietly shut down GeoCities a decade later. When Yahoo! bought GeoCities for $3.7 billion in 1999, CNN Money called it a move that would "solidify Yahoo! 's position as a front-runner in the online popularity contest." History shows us otherwise. Back then, GeoCities was the third most visited "site" on the Web. But it really served as a platform for online communities and for users to create their own homepages on the Internet — much like what Tumblr does today. Geocities never quite figured out monetization and scale. "Sometimes it's market forces, sometimes the fire just gets snuffed out," said Scott Appleby, a tech industry analyst who was bullish on the GeoCities acquisition in 1999. "There was a thought then that everyone would have their own Web page, and they realized we don't really need that." Yahoo has not yet responded to requests for an interview on the GeoCities history, or its other previous acquisitions. The search giant purchased the Internet video streaming service for $5.7 billion. It promised to "integrate multimedia services throughout the Yahoo! network." Today, it's no more. After the acquisition, Yahoo! split the services previously offered by Broadcast.com into separate music and video services — Launchcast and Platinum — but both have quietly folded. Key in broadcast.com today and it is a redirect to the main Yahoo site. But the legacy of Broadcast.com can be considered long, depending on how you look at it. The sale helped make co-founder Mark Cuban $1 billion richer — and famous. He wound up buying the NBA's Dallas Mavericks for $307 million, investing in ventures like HDNet, and getting a whole storyline on HBO's Entourage. Overture is credited as a pioneer in the sale of advertising linked to online search results, but Yahoo struggled to absorb the once-thriving company into its larger culture. Overture's patent for a system to sell advertising displayed next to Web searches was at issue in a years-long legal battle against Google that ended in a settlement in which Yahoo received $365 million in Google shares. But in the decade following the settlement, Google went on to capitalize on paid search and become an industry behemoth while Yahoo has seen its users and its revenue sources dwindle. Explaining the quiet shutdowns of once-thriving companies acquired by Yahoo, Appleby said, "Sometimes it's hard for these companies to grow and survive and thrive in a larger hierarchical company ... The only way for these [acquisitions] to make sense for larger companies is for the large company to continue to grow and make money." "For the first couple of years, things were fine. [Flickr co-founder Caterina] Fake told Gizmodo that 'Yahoo was a good fit initially' and 'in the subsequent two years after the acquisition, Flickr blossomed.' Then Yahoo's Corporate Development department began to bleed Flickr dry, denying it resources because it didn't generate sufficient revenue. 'The money goes to the cash cows, not the cash calf,' as one anonymous Yahoo employee told Gizmodo. Instead of constantly innovating, Flickr management found itself in meetings defending the product." While Yahoo's historically large purchases didn't pan out, it could benefit from lessons of a rocky past. "Unlike 1999, when Yahoo didn't necessarily need to do a deal like Geocities, 2013 seems to present itself as a time when a Yahoo/Tumblr tie-up would make sense," writes Tristan Lewis in Forbes. "Yahoo and Tumblr may be looking at the Facebook/Instagram blueprint and hoping for the same magic." And Yahoo is not the same company it was in 1999, or even 2011. Still, when CEO Marissa Mayer, who joined the company last year from Google, held a conference call Monday morning to explain the decision, Wall Street analysts had lots of questions about how Tumblr would pay for itself. "Tumblr is now at a point...where they do know what it is, and it makes sense to monetize it, if it is very tasteful and seamless," Mayer said. She's following a path tread by many other tech companies: First, attract huge audiences; and only after hundreds of millions of users are engaged with the service do you begin to think about how to make money from it. Mayer said Tumblr is now ready for that final step. "Tumblr is at the point where they do know what it is, and it makes sense to monetize it in a way that is very tasteful and seamless," Mayer said. The inclusion of Tumblr into its numbers could bump Yahoo's traffic by 50 percent a year, Mayer estimated. If advertising can be married with users of that scale, the deal could be profitable. "It's too early to say, 'Hey, she paid too much for this company,' " Appleby said. She's made a lot of changes, and many of which for the good of the culture." One thing the Tumblr acquisition does have in common with all its predecessors: It's making the original founders and investors boatloads of cash, and the people behind the acquired companies seem thrilled about it. Tumblr CEO David Karp wrote that he's "elated" and "couldn't be more excited." NPR's Steve Henn contributed to this story.